A collision, especially when someone gets injured, is a road scenario every driver dreads as well as their car breaking down where help is not close by. 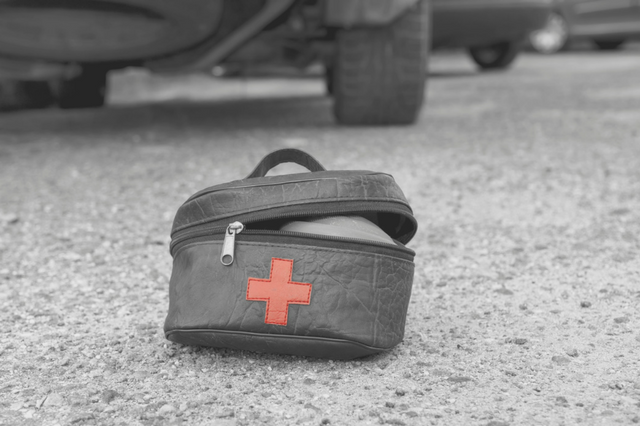 We have already outlined what you need to do after you get in an accident, but there are also certain ways to be prepared for an emergency situation. Have something to eat in case you get hungry. Include a can of cookies, or a few biscuits, and bottled water. A device-charging cord is a crucial item in your kit. With it, you can charge your mobile phone conveniently while driving. If you get lost, the GPS tracker can help you figure out where you are or how to get to where you need to go. Keep a phone charger so you can also call for help. Jumper cables are used to connect your car’s dead battery to another battery source to charge it. To prevent battery explosions, make sure to first connect the jumper cables to the dead battery before connecting them to the good one. This is so you do not get drenched when you need to change tires in the rain. Blankets will keep you warm during cold nights when you are stuck on the road without fuel and have to wait for help. Most mobile phones are equipped with flashlight apps, but they are not created for poking around hot engines or searching for something under your car. A flashlight emits more light and is more durable than a phone. Flares or reflective triangles warn incoming traffic of an emergency situation. They create a protective “safety zone” around your disabled vehicle. Keep your spare tires in the best shape possible. An article we have previously written explains when it’s time to change your tires. A foam sealant is an inexpensive way to quickly plug a leak without changing the tire and gives you just enough time to get you to the nearest auto repair shop. A duct tape is a cheap and quick fix-it solution, such as when you temporarily need to re-attach a side mirror. No driver in their right minds would want anything untoward to happen while on the road, especially in unfamiliar territory, however unfortunate things do happen. As such, it pays to leave the garage prepared for any possible contingency. It’s better to be safe than sorry. Western Slope Driving Institute's Littleton driving school offers professional driving instruction by former law enforcement officers. We offer a wide range of courses to choose from, even customized ones to fit your specific needs – from precision skills to driving test preparation, from online courses to classroom instruction. Contact us today to get your teenage driver signed up for a course. Click here for some tips and advices on parallel parking.